This product comes with 24 task with QR codes for students to practice various skills associated with place value, such as adding and subtracting multi digit whole numbers, comparing numbers, writing numbers in expanded, word, and standard form, and more. 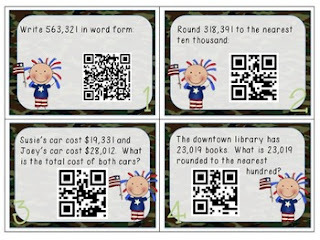 -----> I have provided 24 task cards WITH QR codes, and 24 task cards WITHOUT. The task cards are exactly the same in both sets. These task cards are aligned directly with Go Math! chapter 1 for 4th grade.